A week ago, I stumbled across an anomaly that puzzled me. Looking at the SPX weekly, it appeared that we had a significant correction every 90 days or so. I posted a quick chart on May 2 that, when eyeballed, looked pretty convincing. Now that I’ve had the opportunity to go back and study it a bit, I’m convinced there’s a bona fide phenomenon here. Digging into the SPX daily data, it’s remarkably consistent. I found 15 instances, going back to July 2007, where we had a downturn within 15 calendar days on an 87 day (average) cycle. The longest cycle was 105 days, reached 8/9/10 and 2/18/11. The shortest — and only one that didn’t meet the +/- 15 day criteria — was 63 days reached on 2/27/08. Most of the big declines were captured by the cycles. One notable exception was the June ’09 decline, which was bigger than the May ’09 decline captured in the predicted time frame. I measured the declines beginning with the intraday high within 15 calendar days of the cycle predicted date. I then measured the lowest point within 3 trading days, within 30 trading days, and within the remainder of the cycle. The range of 3-day declines was 1.85 — 9.99%, with a mean of 4.16% and median of 3.63%. The range of 30-day declines was 3.88 — 26.45%, with a mean of 11.40% and median of 10.18%. The range of intra-cycle declines was 3.88 — 36.15%, with a mean of 13.31% and a median of 10.79%. If we were to rally up to the .786 fib off the Mar ’09 lows (1381.50), the model would suggest a decline within 3 days to 1324, within 30 days to 1224 and intra-cycle to 1198. The fact that each of these price levels is significant (50-day EMA, .618 fib, round number) gives me additional confidence. Last, as someone who’s admittedly bearish at this juncture in the economy/market, I should point out that the biggest cycle declines I found were only the first stage of multi-cycle declines — especially the Oct ’07 — Mar ’09 crash. So, it’s entirely possible that a decline to 1200 within 87 days of the next cycle start is only the first stage in a larger move down — the first leg down of P.
On the other hand, this could be one of those 4% blips that’s already come and gone. The 1370 high was on May 2 — 73 days into the cycle since 2/18. We were down 3.02% when we hit 1329 on Mar 5. 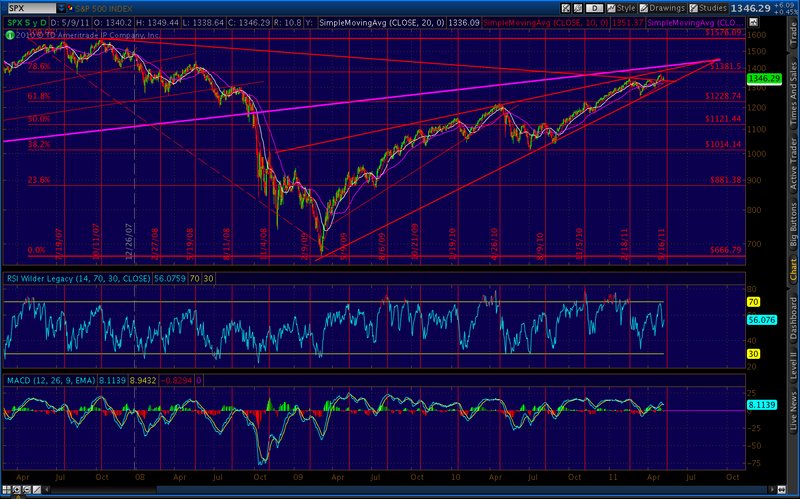 (2) we’re VERY far along in a rising wedge started in Mar ’09. 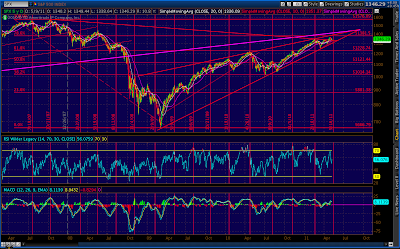 (3) we’re right up against the supercycle line from the early 90’s, currently about 1390-1400.